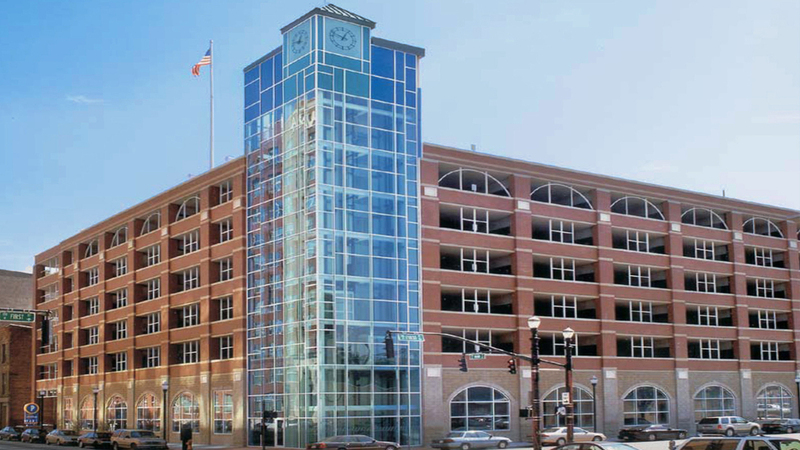 First And Main Parking Structure | Cary Kopczynski & Company, Inc.
To facilitate the revitalization of its downtown, the city of Louisville commissioned a design-build competition for a new six-story parking garage. CKC teamed with a Cleveland contractor and provided a design that met the owner’s rigorous requirements. The structural frame consists of a post-tensioned concrete beam and slab system, with lateral loads resisted by beam-column frames. This provides an open garage with enhanced security. To address the owner’s durability concerns, CKC specified a high performance, yet economical, concrete mix. The concrete cover over slab reinforcing was also increased. With these added measures, a minimum design life of 50 years was provided, satisfying the owner’s requirements.